Red Coins in the Hotel is the eighth episode of Sirena Beach in Super Mario Sunshine. 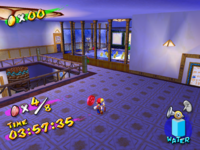 The episode's objective is to collect the Red Coins placed throughout Hotel Delfino. Directly in front of the Red Coin Switch. In the women's restroom to the right. By jumping through the leak in the men's room and using the bed to reach the above floor, the player can reach the third Red Coin in the pool area. Jumping back down through the previous panel back into the bedroom, the player can find the fourth Red Coin in a bedroom farther ahead by jumping through the Boo painting. Leaving the room, the player can find the fifth Red Coin in the center of the second floor lobby. In the center of the third floor's lobby. By using the attic and making their way through the passage to the right of the cleaning Pianta and continuing to the corner room, the player can Ground Pound into the room below. Spraying the poster will allow Mario to jump through and find the seventh Red Coin. By jumping through a panel back in the room through the poster, the player can find the final Red Coin in an alcove. This page was last edited on December 12, 2017, at 23:52.